The following pages include a typical specification (in the Construction Specification Institute format). This specification is intended to be used as part of a project or as a stand-alone specification for the purchase of a swimming pool, aquatic facility or water feature item. This specification is not proprietary or intended to limit competition. The purpose of this specification is to establish minimum performance and quality standards. The use of this specification does not preclude other manufacturers or suppliers from bidding. The use of a detailed specification ensures that the purchaser receives the quality installed system expected. It is recommended that the purchaser understands these specifications and demand that all potential suppliers meet the minimum requirements. and The Association of Pool and Spa Professional (APSP) Guidelines. It is recommended that a working supervisor possessing both APSP, CSP Certification and at least 5 years field experience installing swimming pool membranes be employed to oversee the PVC membrane installation project and report directly to the owner’s representative. documents if used as part of this project are included as a part of this Section as though bound herein. requirements established for this project will not be considered. G. Attachment: PVC coated stainless steel edging & sheets, weld strip. M. Refer to Section ______, Alternates, for alternates that may affect the Work of this Section. herein specified and as denoted on the accompanying drawings. B. Related Work and Responsibilities Assigned to Others: Coordinate all activities with the appropriate party. shelter and weather protection for the completion of the work. cleaning of the existing interior surfaces prior to system installation. 4. Removal and reinstallation of deck and accessory equipment. close proximity to pool area. components, or any related electrical work. 7. Temporary facilities, including electrical power and restroom facilities close to the installation site. 9. Final cleaning of pool area outside of the PVC Membrane System. protecting workmen and the public. monitor water table around pool to minimize hydrostatic damage to pool shell. project documents contradict this section, the requirements of this section shall govern. reasonably required for complete, operational PVC Membrane System installation(s). the named manufacturer may be provided. 10 days prior to the date set for the opening of bids. express requirements of the project documents. systems by the named manufacturer may be provided. the execution of the work implied by the drawings. written consent of the Consultant or the Owner. 1. List each material furnished and application and cross-reference to the shop drawing(s). 2. Provide dimensional shop drawings showing all pertinent dimensions. action of typical situations that may be encountered. operational aspects of maintaining the swimming pool facilities. detailing proper care, maintenance and cleaning of the system. Design and manufacture of PVC Lining Systems used in swimming pool, aquatic or water feature applications. requirements that govern in the State of the installation. the specified manufacturer’s system may be incorporated in the project. the PVC Membrane System by others either during construction or when operational. damage. Packaging shall have in clear view labeled identification as to the physical content and description of product including but not limited to thickness, color, texture and top coat stain guard applied. manner which could cause damage or deformity. supervision of the manufacturer or his representative is strictly prohibited. installation of the PVC Membrane System will be provided by others. and large cracks. These irregularities shall be repaired per ICRI guidelines with suitable patching material or covered with PVC strip or stainless steel sheet as detailed on the drawings. Tar, oil, or petrochemical compounds must be removed or isolated. Surface preparation is not part of this contract unless otherwise specified. A. 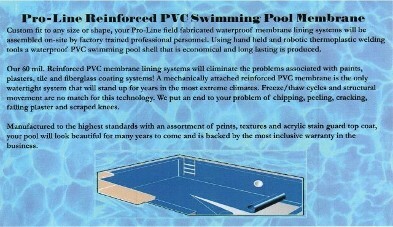 Manufacturer: Pro-Line® Systems 60 mil Reinforced PVC Swimming Pool Membrane System. All bids shall include only PVC Membrane Lining Systems from this manufacturer. C. If alternate systems are approved prior to bidding, all contractors will be notified by addendum. D. Source Limitations: Provide all PVC Membrane System components through one source. materials are supplied as a system. bonded to a polyester mesh substrate. with the following chemical and physical properties as listed herein. Only those membranes specifically formulated for swimming pool use shall be considered. Roofing membranes, general waterproofing membranes, and vinyl liners shall not be acceptable. The membrane shall be furnished in a color scheme as detailed by the drawings as selected by the owner. B. The PVC Membrane shall be manufactured with a clear top coat to resist staining, and microbial action. *The information in this data sheet is considered to be accurate and reliable; however, no guarantee or warranty is expressed or implied. specifically designed embossed surface suitable for high traffic areas, shall be installed as detailed on the drawings. Furnished in the color scheme as detailed by the drawings or as selected by the owner. freeze, thaw, moisture, soil-chemical abrasion, be resistant to biological degradation and ultraviolet deterioration and shall conform strictly to the following chemical and physical properties. could potentially be damaging to the liner. shell may be used where support of a corner is not required. Anchoring of Pool membrane to shell through the use of glue or adhesives is not permitted. Mechanical attachment of the membrane to the shell with non-ferrous anchors is the only acceptable method. required for reinforcement, shaping, separation as required and be installed over expansion joints as detailed. I. Sanitizing Agents: Sanitizing agents, formulated from a mixture of halogenated organic compounds shall be applied to the pool surface, beneath the pool liner and slip sheet, to help prevent the growth of microbes or fungus. secured with stainless steel anchoring systems. Manufacturer specific fitting faceplates may also be used. K. Edge Sealant: Liquid PVC edge sealant solution shall be applied to all free material edges after welding. utilizing an edge sealant solution or fully encapsulated polyester scrim will be considered. with high early strength, shrinkage compensated cementacious patching compounds, per ICRI guidelines. and suitable for drilling of ½ inch diameter anchor holes for the installation of the PVC compression flanges. five (5) pool projects similar in size and scope to this project. installing contractor or shall be a factory trained licensee of the manufacturer. accordance with the intent of these specifications. stainless steel compression skirt shall be continuously welded to the stainless steel gutter system. stainless steel membrane compression skirt will be allowed. use by any contractor installing a PVC Membrane System in a swimming pool facility. ensure that the gutter system is watertight. A. After acceptance of the prepared surface perform any minor patching and apply anti fungal treatment to surface. anchor attachment and other transitions. Attach to the pool surface with drive rivets approximately six (6)” on center. C. Isolate working cracks and expansion joints with flexible PVC or stainless steel sheet (24-gauge) as required. adequate to secure the fleece. provides the mechanical attachment to the pool structure.PVC glued to the slip sheet for attachment is not acceptable. of overlap and ¾” weld. Probe seams with a hand-held lance or air lance to ensure complete welding. Completely close the seam edge with exposed polyester scrim using a PVC cut edge sealing compound. layers of the membrane material is not acceptable. Patching of relief cuts resulting in a visible patch is not acceptable. Relief cuts and the associated patch may be used if covered by the flooring membrane. All material sections are to be applied in full roll widths and lengths except where pool conditions dictate otherwise. To minimize visible seams, the membrane is to be applied to the pool walls in horizontally oriented sheets. Except on curved wall perimeters, applying the membrane in vertically oriented sheets is not acceptable. There are to be no visible patches on the surface of the completed membrane. representative is to provide detailed instructions as to necessary markings. construction materials, utilizing only sealants suitable for submerged application in swimming pools as stated in the sealant manufacturers specification sheet and printed on cartridge for ease of inspection and compatibility. ensure a watertight seal. Specified caulking may be used for gasket and shall be warranted as the membrane. Semi rigid compression strip on uneven surfaces and fitting specific face plates may be used. “Wrapping and clamping” of the membrane material around rail goods penetrations the membrane is not acceptable. completion and testing of all seams. Retesting may be necessary to ensure complete sealing. period of 6 hours without evidence of leakage. place the system in operation and give operating instructions relative to its care and use. completion of the project. Provide to owner’s representative for review and signature prior to turning over project.